The labyrinth is a design based on a single path leading to the center and then back out of the same path. Along the way there are many twists and turns, symbolic of the twists and turns in our lives. Often the labyrinth is confused with a maze, but the two are opposites. The path of the labyrinth always leads to the center. The maze has many paths that lead nowhere. In a maze we lose ourselves. In a labyrinth we find ourselves. 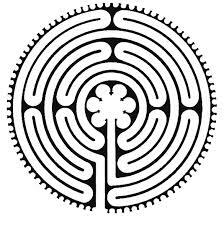 The labyrinth allows us to relax and be present on the journey itself. Many times we see our lives as mazes…we feel that we have lost our way, that our path is leading nowhere. As Christians on a spiritual journey, we need to change our view of ‘our life as a maze’ to that of ‘our life as a labyrinth’. We need to acknowledge that our path leads to One center. The center is where we will all eventually meet. Be thankful for your journey, cherish the moments, memories, and people you meet along the way. An outdoor labyrinth can be found at Michaela Farm. For smaller labyrinths, stop by the center. We have several that can be enjoyed! The following poem was written by Sally Meyer, 2014. Sally is a participant in OFC programs. It’s that time of year again…we hear everyone asking us about our New Year’s Resolutions. Looking back on 2014 did you grow in your faith?For 2015 do you have a plan to grow in your relationship with God? My hope and prayer for the new year is to put spiritual growth at the top of my New Year’s Resolution list…what will be at the top of yours?